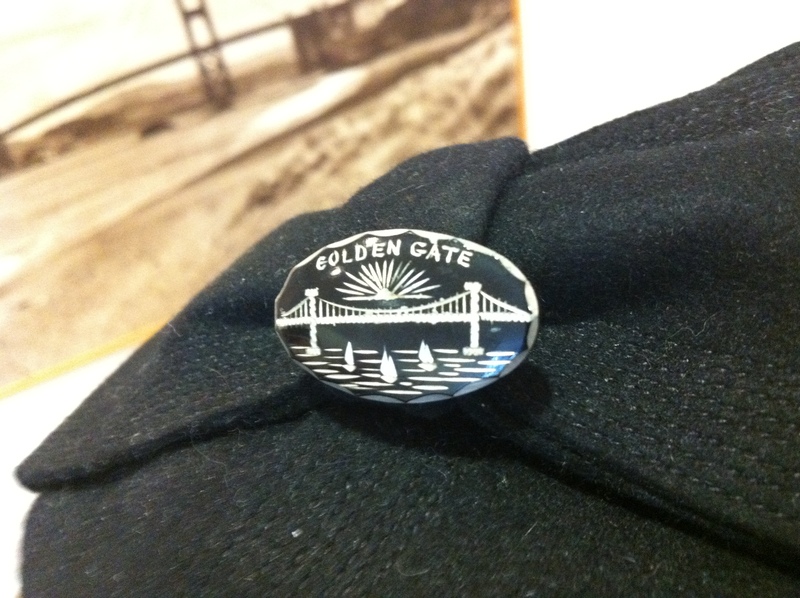 My 1930s Golden Gate Bridge pin. Photo by Kelly Cash. 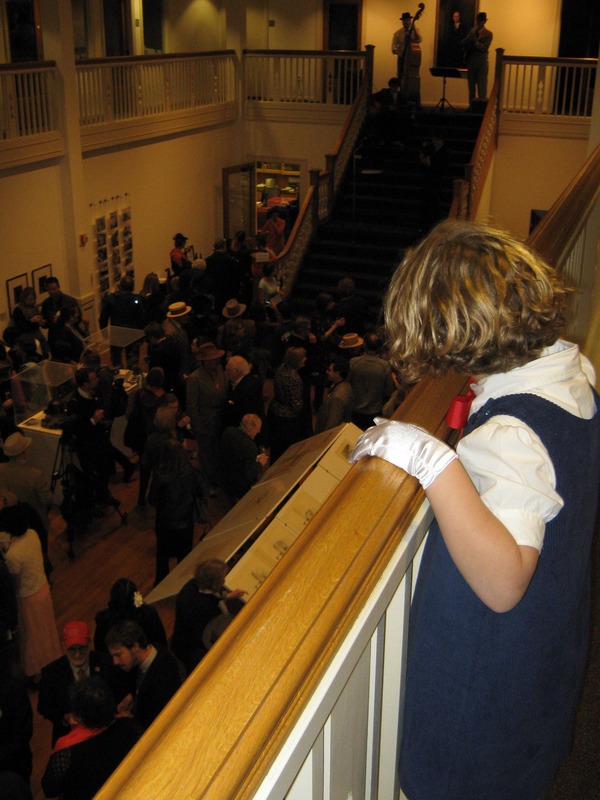 What a grand time we all had at the California Historical Society’s opening reception for their exhibit – A Wild Flight of the Imagination: The Story of the Golden Gate Bridge. All 700 of us enjoyed an afternoon of music by the Frisky Frolics, attendees in 1930s fashions, a line of beautiful classic cars parked outside and of course the exhibit itself, which celebrates the 75th anniversary of the bridge’s opening and is ongoing through October 14, 2012. 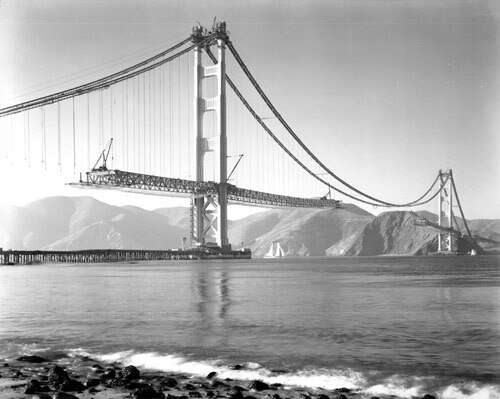 We love our Golden Gate, but I don’t think many of us stop to consider the bridge’s history. There were folks in favor of the bridge like the oil companies, and plenty of opposers such as the Sierra Club. San Francisco residents and politicians were also at odds and there was a special election held for voters. This exhibit gives viewers a rare opportunity to learn the whole story as well as get a peek into what life was like in the area before the bridge. Eight-year-old Ruby knows that in 1937 a lady did not leave the house without her gloves. Photo by Richard Aiello. Once inside attendees mingled and perused displays of bridge photographs, area landscapes, artwork, bridge artifacts, newspaper clippings, and propaganda for and against the building of the bridge. My favorite find was a scrapbook belonging to San Francisco teenager Catherine Cline. Catherine devoted eight pages of her scrapbook to the building of the bridge. She pasted newspaper clippings, party invitations, and hand written notes inside her book, all reflecting enthusiasm for a momentous occasion in the city’s history. Exhibit curator Jessica Hough donned a lovely black and white 1930s knit suit. Anthea Hartig, California Historical Society Executive Director gave a nod to the bridge with her vintage International Orange knit suit. Both ladies were dressed by avid vintage collector Kristin Werner, who also helped promote the event. Laurie Gordon from the Art Deco Society of California was there speaking to the press as were a few Decobelles, who posed for photos and danced with attendees. The ADSC was a co-sponsor of the event and is also working closely with the Golden Gate Bridge Highway and Transportation District on other upcoming festivities. In honor of the bridge’s jubilee year, I’ve been sporting a steel pin etched with a depiction of the bridge. A find on Etsy, the little treasure dates from 1937. For the reception I attached it to my vintage felt hat (see photo above). Among the chatting and discussions about the exhibit, I heard a lot of buzz about the 2012 Art Deco Society Preservation Ball at Bimbo’s coming up on May 5th. The theme for this year’s ball is of course, the Golden Gate Bridge and people are already planning their special 1930s ensembles. Congratulations to the California Historical Society and everyone who worked so hard on this fabulous exhibition. A Wild Flight of the Imagination: The Story of the Golden Gate Bridge at the California Historical Society, 678 Mission Street, SF. Vivienne Westwood London Fashion Week 2012. After her show at London Fashion Week (February 17-22, 2012), Vivienne Westwood spoke her mind on the state of modern fashion. Everybody looks like clones … We are so conformist, nobody is thinking. We are all sucking up stuff. We have been trained to be consumers and we are all-consuming far too much. What I’m saying is buy less and choose well. I think what Vivienne is talking about is style. What people lack is individual style. They might be decked out in the latest designer must-haves, but there’s no personal touch, no pizzazz. Take a look at what Vivienne is wearing in the photo above : a t-shirt, baggy trousers, and platform shoes with colorful socks – that is individual style. Hey readers, did you know that the Golden Gate Bridge is celebrating a jubilee? Yessiree, our golden treasure turns 75 this year. The California Historical Society is in on the celebrations with their exhibit A Wild Flight of the Imagination: The Story of the Golden Gate Bridge. Due to open on February 26th, 2012 the exhibit will include rarely seen works of art, personal letters, photographs, film footage, and artifacts from 100 years before the bridge to opening day in 1937. Visitors will learn about what Bay Area life was like pre-bridge (think ferry rides), how the public initially reacted to the bridge proposal (lacked enthusiasm), and the media campaign behind the project (extensive). To kick off the exhibit the California Historical Society is having a party on Sunday, February 26 (the anniversary of the day the project broke ground in 1933), 2:30-4:30. 678 Mission Street, SF. Seventy-five years as golden as ever and still going strong. That is something to celebrate. 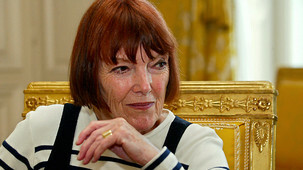 Mary Quant still sports her Sassoon hairdo. Photo courtesy of BBC Radio. Mary Quant, the hip and happening designer of the mini-skirt in the 1960s, was a recent guest on BBC Radio 4 Woman’s Hour. Host Jenni Murray asked Mary, now 78, how she likes to see older women dressed. I like them to look as though they’re enjoying what they’re wearing and to experiment with everything new that comes along. Style Caster Fashion Week totes designed by Serene Bacigalupi. There’s a new trend in totes. It used to be that a designer logo bag was the must-have but ah ha, not anymore. Nope, what best reflects fashion status in today’s Austerity and Occupy world is a freebie. A limited edition tote from a fashion show, a museum exhibit, or an art opening says, I’m not showy but I am connected. StyleCaster saw Serene’s artwork on display at the Chelsea Market in NYC and thought her quirky and imaginative style would be a good fit. 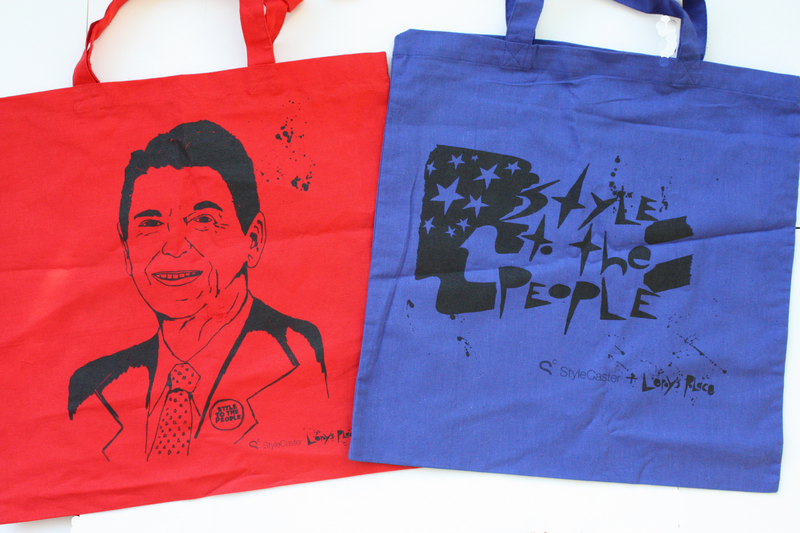 Of course the blue bag depicts our current president Barack Obama but the question was, who stands for the red? Since the GOP are still tripping over themselves to the primaries, Serene and StyleCaster decided to forgo a current candidate and dig into the 80s for an iconic Republican image. Who other than Ronald Reagan? I love this one with good old Ronnie sporting a badge that says, Style to the People. It’s just too funny. Check out Serene’s other fabulous artwork on Etsy. 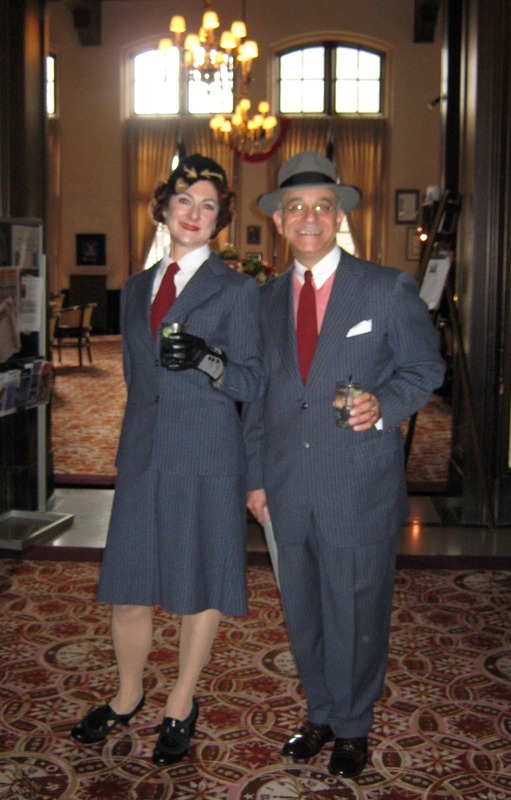 Models Lori Leigh Gieleghem & Joe DiPietro model vintage his and her suits. The Isn’t it Romantic Vintage Show and Sale was great fun as I knew it would be. I came home with a 1960s black structured handbag covered with faux broad-tail fur. What a perfect match to my custom-made coat. Lori Leigh has paired the suit with gloves and a sweet velvet hat, which was a gift from her brother years ago when such treasures could still be found for a song at The Salvation Army. Joe is also sporting the requisite hat for gentlemen plus the all important pocket square. Lori Leigh and Joe are both wearing red ties for the Valentine’s Day theme of the show. Matching his and her is such fun. My Valentine and I often wear matching black berets and always receive a compliment or two. It was a treat to see these suits … I love the concept and can’t help pondering how it might be used as a clue in a mystery story. Happy Valentine’s Day to all my readers. For me after Yve’s death in 2008, fashion is over. I would love to admire something or somebody, but it’s difficult for me to admire fashion people today. 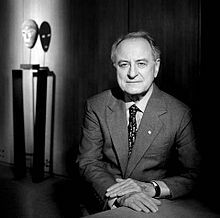 – Pierre Bergé, business partner of Yves Saint Laurent.